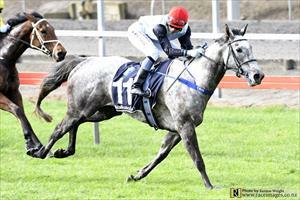 2.44 p.m. R4 12 Crossed My Mind (3 f Zed – The Lions Rule, by Viking Ruler) – Shafiq Rusof; ran a good race for fourth when debuting here on Heavy10 last October and resumed with a solid sixth in the Maiden 3YO 1200 metres on 21 July at Te Rapa. Bred by Mike Moroney, from a mare he trained to win twice up to a mile, she has each way prospects in the $10,000 Maiden 1400 metres. Fixed odds: $13.00 & $4.00.